Fru-Gal.org: $3.18 for Anna's New Sneakers! $3.18 for Anna's New Sneakers! 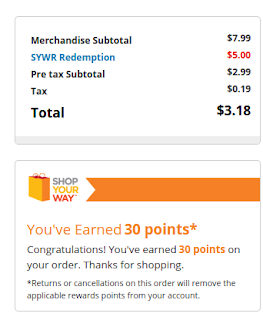 I was able to use a $5 off in points birthday offer (my birthday is this week and I'll be the big 3-0) from Shop Your Way to snag a pair of sneakers for $3.18 with free store pick-up at Sears. Sears is also awesome because they bring out your order to you and you don't have to leave your vehicle (this is amazing for moms with little kids)! *Shop Your Way is the rewards program for Sears, Kmart, and Lands' End. You should totally sign up... they send out free points offers all the time and I score a lot of sweet freebies/deals.